To the Christmas season, that is. I was a little worried that I would have the baby before Thanksgiving, which would have messed up our dinner plans. Also, my "things to do before the baby is born" list is getting shorter every day, but not quite finished. My due date is not for another week and a half, and I figure I should be all set by the end of this week. We had a wonderful Thanksgiving. This year, I prepared as much as I could the night before, such as peeling the potatoes, making the dough for the pie crusts, prepping all the veggies, making the cheesecake, etc. It really helped make things easier and faster on Thursday, since I was the only one cooking for our family. I also tried a new recipe for dinner rolls, which I found in the Dec./Jan. issue of the Taste of Home magazine. They were FANTASTIC! Definitely a keeper! The kids kept themselves busy playing Legos with Dad, riding their bikes on our street, reading, coloring, making Thanksgiving crafts, and listening to some Patch the Pirate CDs while I was cooking. Then I took a long nap with the girls after our late lunch. When we got up, everyone gorged themselves on dessert ~ pumpkin pie with whipped cream, apple pie with ice cream, cheesecake, and lots of hot chocolate. I am at a point in my pregnancy when I can only eat a couple of bites at a time, so thankfully, I couldn't have overdone the desserts even if I had wanted to. Friday, the kids and I just spent a quiet day at home while my husband worked. We didn't want to leave the house and get caught in "Black Friday" shopping - ugh! Today, we decorated the house for Christmas. I just set up the tree, then my husband and the boys decorated it with lights and ornaments. A couple of the glass ornaments inevitably hit the ground and shattered, but I still think sweeping a couple of times was much less work than decorating the tree. Plus, the kids had a lot of fun doing it. I am almost done making everyone's advent calendars. There are still several Christmas gifts I am working on, as well as some birthday gifts for John. But all in all, I feel ready and prepared for the arrival of the new baby. God's very good to us. A good reminder for all of us moms who will be spending the whole day cooking, and washing dishes again and again, to prepare a dinner that will be eaten up in 20 minutes. As long as there is food to prepare, and hungry little mouths to gobble it all up, there is much to be thankful for. Hope you have a very blessed Thanksgiving! Someone recently asked what my husband and I thought about the new TSA "enhanced" pat-downs. You know, the ones where travelers have to submit to being molested through their clothes in order to be allowed to fly, often simply at the caprice of whatever agent happens to be on duty. This is not an exaggeration - I cannot imagine any sane person who could allow a complete stranger to touch, squeeze, and probe their private parts through their clothes, or alternatively submit to a (very unhealthy) full-body scan that yields images of them without their clothes. Or, you may choose to walk out on your flight, and be threatened with a civil lawsuit by TSA. Did you know that even young children are subjected to this kind of perversion? One can only imagine the trauma that this would cause many of them. In any case, these children are being brainwashed that it is okay for government agents to touch them like that, but anytime anyone else does it, it is considered molestation. I mean, with the government takeover of the health care system, doctors, nurses, and TSA agents all work for the same Big Daddy. Well, at least one pediatrician in the area was not quite the saint he was supposed to be. And then, shock of shocks, he fled house arrest a couple of months ago. So Kent Hovind goes to federal prison for 10 years for supposed tax evasion, while a pediatrician distributing child p*rn on the internet gets house arrest that is not even very well supervised. Next, we will be told that police can carry out these same "pat-downs" because, after all, they work for the government, and thus are god-like and always above reproach. And while we are at it, kids on their way into school should be subject to the same procedures, but again, no worries - we'll have teachers doing it, because being government workers, they can do no wrong. We need to trust them more. All this reminded me of a guy I read about in the local news last week. This 62-year old man was a school bus driver until last year, when there was an (unsuccessful) investigation into allegations of child molestation. Just last week, he was booked on two separate counts of child molestation, and aggravated assault, after luring a 9-year old girl into his car. "[T]he victim disclosed that her attacker touched her buttocks while she was standing outside of his car, police said. She also stated he touched her private parts over her clothing with his hand, while she was sitting on the front passenger seat" If he had been working for TSA, this would have been just another day at the office. Whatever happened to "Give me liberty, or give me death"? This country was founded by men who would rather DIE than give up freedom. Yet today, we are scared of the boogieman. Now, I cannot even fly anywhere without risking that my children or I myself will be molested. Which means, I will not be flying anywhere. And people still think we live in a free country? What else do they have to do before everyone wakes up and smells the coffee? I FINALLY got a birth tub today, after trying to get one lined up for the last 4 weeks. Which really is nobody's fault but mine, since trying to reserve a tub that close to my due date is a somewhat crazy notion. I usually call the "tub lady" in my first trimester, because she books out months and months in advance. Sure enough, she was all booked out. 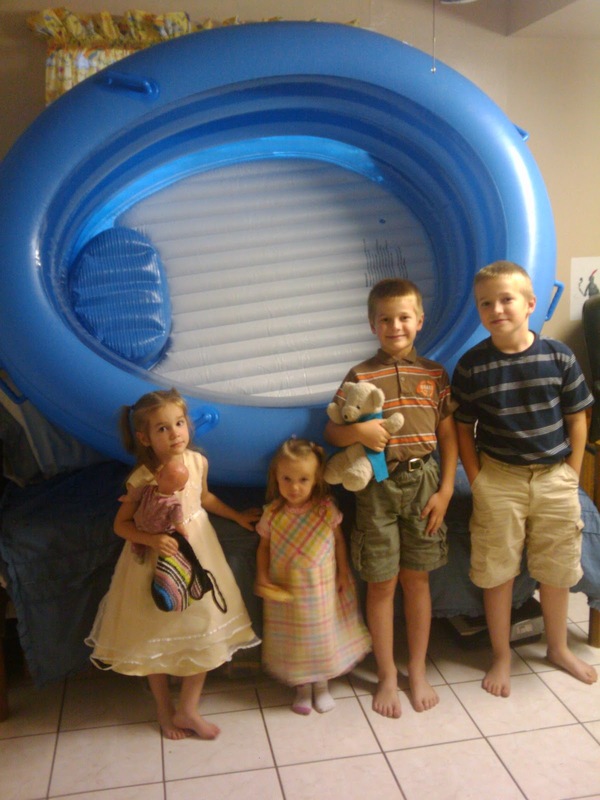 It was getting to a point where I thought about just ordering a kiddie pool on Amazon, but did not like that idea too much because it would have been pretty shallow compared to an actual birth tub. Then the midwife I had with Miriam and Becky (which sadly did not work out to have her again this time) emailed to tell me she had a birth tub in her garage, and that I could use it for free! The kids and I picked it up today at her office; it was so nice to see her again. The tub was a breeze to inflate with an electric air pump another lady from church had loaned me, it didn't even take 5 minutes. Of course the kids got all excited about it and wanted me to fill it with water just for fun, but I know better than that! The tub will stay deflated and stored out of their reach until I go into labor!! Aside from all that fun, I worked on the kids' advent calendars for a little while, and also managed to precook a few more breakfasts and dinners today. I am just now done with the last of it, and getting ready to clean the kitchen one last time, as well as the living room and the other "public" areas of the house. I really enjoy getting everything neat and tidy at night, even though it never stays like that for more than 5 minutes once the kids get up. It's like bailing water from a sinking boat - you don't make any progress, but you have to just keep at it. Off I go! Well, not really a peek, as I'm too tired to get up, take an actual photo of the inside of my freezer, and upload it. This is just a list of all the meals that I am working on cooking and freezing to have in stock for after the baby is born. But once I am all done, I will post a picture of it all. We really have two fridges/freezers. I have emptied one of the freezers completely by moving everything that was in it into the other freezer. That way all the precooked foods will be in one spot and easy to find. There are two lists of meals - breakfasts and dinners, which are the two meals I cook every day. For lunch, we almost always have leftovers from the previous night's dinner (I make a double batch of everything so there is plenty of food for two meals). It saves me having to cook in the mornings, which are reserved for school work or urgent errands. The items in bold are the ones that are already made and frozen. Almost all of them I was able to cook up in the last couple of days, and hope to be done with all the cooking by the end of the week. Solomon has been my kitchen helper - voluntarily, he just really enjoys helping me cook and learning how to do it. Some lucky wife one day will have a husband who knows how to cook! Obviously, some stuff like eggs, fruit, salads etc. will have to be prepared fresh before eating - I'm just talking about making the parts of the meal that can be prepared ahead of time. Monday, my husband had work to do in Kingman, Arizona, which is about 3 hours drive northwest of us. His job was such that he could bring the three boys along, which was something he had been wanting to do for a while to get some "man time" with them. I was glad not just to have the boys off my hands for the day (they are a lot more energetic and wild than the girls! ), but also really excited about getting some girl time with my sweet daughters before the baby comes. After the guys left early in the morning, the girls and I hopped back into the big master bed and lounged around for another hour, cuddling and dozing. When we finally got up and ready, we decided it was high time to take Becky for her first hair cut (actually, just a trim). I have always cut the boys' hair, but would never try doing that on the girls. Since they only get it trimmed once every six months or so, it's a splurge I feel is acceptable. The only problem with that has been that every place I have ever taken Miriam did a terrible job, except for the kids' salon I took her for her first haircut - Lollilocks. They closed their Arizona store shortly after that first hair cut, though, and I had been looking for someplace similar ever since. All other specialty kids' salons I tried offered only movies and computer games as their entertainment/distraction, and were totally overpriced and not even friendly to the children. Regular places like Great Clips did a terrible job on her thin, fine hair. Well, as it turns out, Lollilocks just came back to Phoenix a couple of months ago! It was just as nice, girly, and child-friendly as it ever was. Since Becky had never had her hair trimmed, and her ends were getting rather feathery, I figured a morning without the boys was the perfect time to take both girls. Miriam went first. She was determined to be a perfect little angel after I told her what a fit she'd thrown the last time I took her in for her haircut there. She really is so very different now, very sweet and not at all stubborn like she was two years ago. Out of all the kids, she gets into trouble the least. Becky, who is in that same stubborn stage right now that Miriam was in two years ago, also did very well. She was a little unsure what to think of the whole thing, as you can tell by the way she looks in some of the pictures, but overall she really did enjoy it. Especially the lollipop at the end. That cut above her left eye is from when her brothers, who had build a seesaw with a piece of 2x6, accidentally hit her in the face with it. Being #5, with 3 big brothers, can be painful. If you live in the area (or in Colorado), I highly recommend Lollilocks. They have $5 off coupons in the "Kids Celebrate" magazine (On p. 20, you can print it off the computer. They let me use one for each girl). The coupon brings the total cost per child below what it would cost to go to Great Clips, only they are so much better and funner! When they are done with the hair cut, the girls get to pick out how they want their hair styled ~ all very cute, yet quick and easy to duplicate. I have been copying their hairstyles at home, and also want to go to a workshop that they offer for moms and daughters, where they teach some more of their styles. By the time we got out of there, it was getting close to lunch time. Since there was nothing ready waiting for us at home, and I knew the girls would probably fall asleep on the way home, I figured we'd get lunch out. Since switching to eating all organic at home, we practically never eat out any more at all - maybe once every few months, and even then we only go to places that serve healthy food. Right next to the salon was a "California Pizza Kitchen", which I had never been to but I knew that a lot of people liked it, so I figured it was probably okay. As soon as we were seated, Miriam asked me: "Is this food organic?" to which I replied "no", so she said "I'll just have the cake, then!" I really don't think she cared about being healthy at all, but was rather just looking for an excuse to skip straight ahead to dessert. The girls enjoyed themselves and their food, but my meal turned out to be rather dry and off-tasting. The service was so terrible that on the way home I called CPK's 1-800 number and complained, which is only the second time I have ever done that about any restaurant. The food made me feel sick for the rest of the day, too, although restaurant food has a way of doing that to me in general. Needless to say, I won't be going back there again. When we got home, the girls had, in fact, fallen asleep in the car, so I moved them to their beds for naptime. After they woke up, Miriam asked me do face paints with her. She also wanted me to paint her toe nails, and in the absence of any nail polish, I simply used the face paints on her little toes, too. Which actually worked out nice because it simply washed off the next time she took a bath. We then fixed dinner and baked some cookies for a pregnant lady in our church who had asked me for the recipe because she was craving them. We doubled the batch so there'd be plenty more for when Dad and the boys got home. The guys didn't get home until the evening because they went hiking for several miles near Williams, Arizona. They were very excited to tell me about their day in detail, and I was glad to have them back home. In all, it was a great day from start to finish. Days like that make up for all those days where it seems that everything that can go wrong, does go wrong. Having daughters is such a special blessing!!! Yesterday marked my being 36 weeks pregnant, which is officially the cut-off after which the state of Arizona allows midwife-assisted home birth. I do not feel like birth is imminent, although I also do not think that I will go past my due date, or not by much. Of course, nobody thinks they will! :) All of our babies have been born right around the time they were due, so I am counting on this baby doing likewise. My list of things left to do is getting shorter, but there's still plenty left. Baby will have to understand that he/she can't come before I get such important matters wrapped up as making a Thanksgiving dinner and decorating for Christmas. :) Besides, my midwife won't be back in town for another week, and I am still trying to get the birth tub issue resolved. Then there are other things, such as precooking food, and switching the kids' closets from summer to winter clothes. Aah, the weather here in Phoenix is so funny! Last week, we had yet another heat wave (temps in the 90s midday), while this week is more chilly, high 60s to low 70s. My boys are asking me to get their long pants out, but it is a scientific fact that nothing will guarantee another heat wave like putting their summer clothes away. It seems like such a luxury to finally feel cool after such a long, long, long hot summer. I love being able to leave my front door open all day long and let the fresh air in - even just last week, it was still too hot to do so during the hottest part of the day. Baby is definitely head down, but may be posterior, i.e. facing out toward my belly button, instead of in toward my spine. It makes me be able to feel the baby's movements much more strongly. In fact, sometimes my belly is shifting around so much it almost looks like the baby is trying to just burst out through my skin. It's nice, because it makes it easy for the other kids to feel the movements. If he/she is still in a posterior position at my next prenatal appointment, I think I will need to see my chiropractor, as I usually do around this time in pregnancy. Our first child was born posterior, and it was VERY painful - not something I want to have to go through again. I have been having lots of contractions, and even though this is our 6th child, I still cannot tell the difference between a "Braxton-Hicks" and a "real" contraction. I think they are the exact same thing, except that the latter hurt. I get a few painful ones at night sometimes, but mostly it's just the kind that knock the wind out of me. Other than tiring easily, I feel great most days. Please continue to pray that I will have a healthy rest of my pregnancy and an easy delivery. Last Friday evening, as I arrived at the church building for the sewing class I am currently teaching every other week, I was instead welcomed by a surprise baby shower for our newest addition that the ladies had sneakily planned. It truly was a very nice surprise, and totally unexpected. The food was great, and the desserts even more so. In addition to the gifts I received that evening, I also got two gift cards to two different baby stores. This week, I visited both stores on separate occasions, although I did not end up buying anything at either one yet. I have become somewhat of a "baby gear/clothes/equipment minimalist", so I wanted to think some more about what to buy - probably some clothes once the baby is born, and we know if it's a boy or a girl. While shopping, I saw this bookcase on CLEARANCE at the first store. 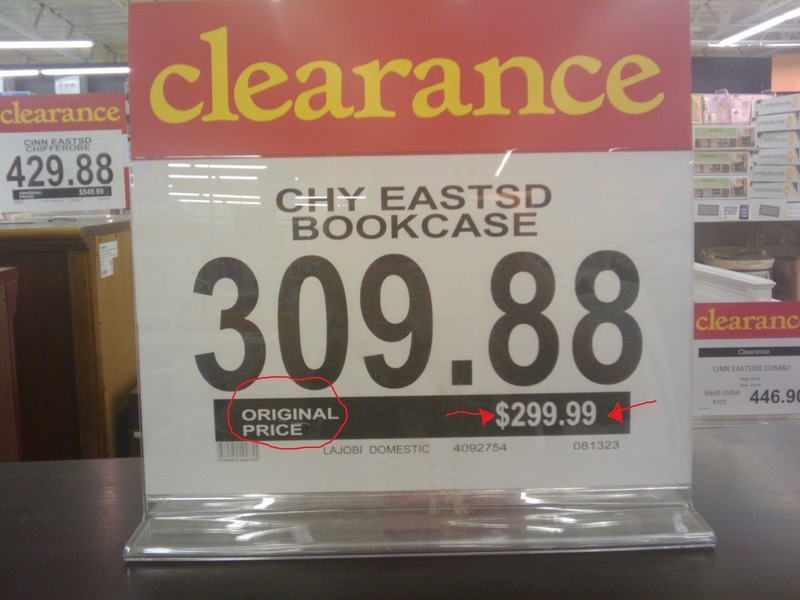 Such an outrageous clearance price caught my attention - how much could it possibly have cost regularly?!? To my amazement, and amusement, I realized that it was $10 less before being put on clearance. What a great deal! Too bad my gift card wasn't quite enough to cover the cost; thus, sadly, I had to pass this sale up. If this had been any other store than the big bad baby store with the "R" in it, I would have simply assumed that it was a misprint. 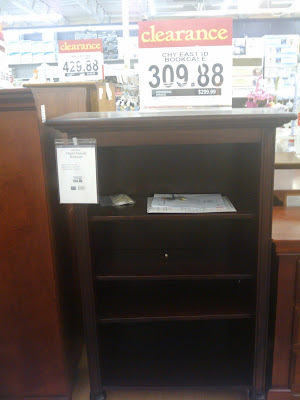 However, I would not be surprised if it wasn't - I mean, only a very ambitious and extremely hormonal first-time mom would ever consider spending that much money on a bookcase for a baby to begin with. The red "clearance" signs will put her system into even more of an emotional nesting tailspin, so much so, that she may never realize that she is actually paying MORE. Just a theory, but not too off the wall considering the store. I mean, just look at the other prices in the background - and this was the clearance section!! 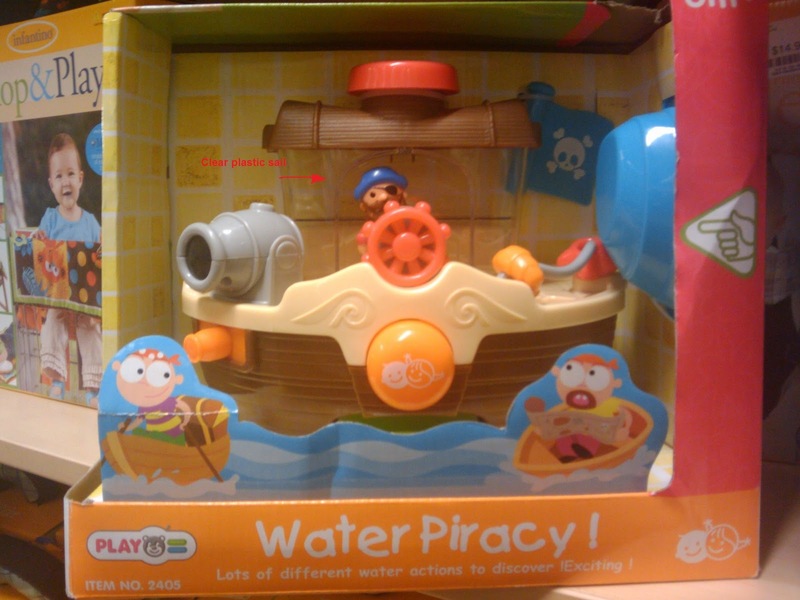 I didn't understand what the big deal was, until he told me "The pirate doesn't have any pants on!" Indeed, he didn't. Not sure if he got plundered, if a sudden gust of wind ripped them off, or if the toy designer in China just felt like being strange that day, but bare he was - except for that funny little red vest and his pirate hat. While maybe this guy is always wedged between the wheel and the sail, thus making his fashion faux-pas less obvious, the sail behind him is made of clear plastic. 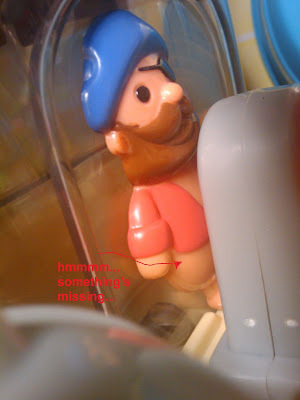 Which means that once this ship is taken out of the cardboard box, his naked backside is in plain view. My kids were scandalized that I just put the toy back on the shelf and did not complain to management on the way out. I'll never hear the end of that! Aaah, baby shopping.... all I can say is that I am glad I am not pregnant with my first, and glad that when we were expecting our first, we were much too poor to entertain the thought of spending money on overpriced and completely useless baby furniture, because I'm sure I would have wanted to just like anyone else. I like what I heard one Dad say recently: You don't need any of that stuff, because you just end up holding the baby the whole time anyway. How very true!! Found this recipe here and loved it so much I wanted to share it. 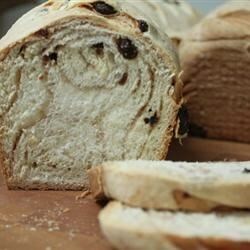 I did make a couple of changes in the below recipe from the original, such as using whole wheat flour in place of the all-purpose, and mixing the cinnamon-sugar into the dough rather than sprinkling it on and rolling the loaves up. I figured that would make it easier to slice the loaves without them falling apart, which it did. I also lowered the oven temperature and shortened the baking time, after several reviews on the original recipe mentioned that the loaves would otherwise start turning too dark. The loaves came out wonderfully moist and fragrant. Even using 100% whole wheat, they were easy to slice, even thinly, without crumbling. This recipe has been added to my stash of all-time favorite staple recipes. This is enough to make three loaves - one to eat fresh out of the oven, one to have for breakfast the next day, and one to freeze or give away! 1. Mix milk and boiling water in mixing bowl to get a lukewarm milk-water-mixture. 2. Dissolve yeast in warm milk-water-mixture, and set aside until yeast is frothy. Mix in eggs, sugar, butter, salt, raisins, and cinnamon. Add the flour gradually to make a stiff dough. 3. Knead dough in mixer or by hand on a lightly floured surface for a few minutes. Place in a large, greased, mixing bowl, and turn to grease the surface of the dough. Cover with a damp cloth. Allow to rise until doubled. 4. Punch dough down, cut into thirds, shape each into a loaf and tuck under ends. Place loaves into well greased 9 x 5 inch pans. Lightly grease tops of loaves. Let rise again for 1 hour. 5. Bake at 325 degrees F (175 degrees C) for 35-45 minutes, or until loaves are lightly browned and sound hollow when knocked. Remove loaves from pans, and immediately brush with melted butter. Let cool before slicing. Miriam: "Mom, maybe your baby is hungry?" (meaning the baby in my tummy). Me: "Maybe it is." Miriam: "Maybe we should have dinner right now?" Miriam: "Does the Bible say, 'If you love me, keep my commandments?' Me: "Yes, it does." Miriam: "I love you very much!" Me: "I love you, too!" Miriam: "So does that meant that I should keep your commandments?" Me: "Miriam, did you use the bathroom first?" Miriam: "Yes." Me: "When did you last use it?" Miriam (somewhat exasperated): "Mom, I just used the bathroom two days ago!" Miriam: "Mom, my feet are getting really little." (then, somewhat worried) "I am never going to be an indult [her word for adult] like that!" A few days ago, I opened a bank account (on Thursday). On Friday, Mom bought me a new wallet at the thrift store that was used. Yesterday (Saturday) I noticed a pocket I had never noticed before. I stuck my hand in it to see if there was anything in it. There was indeed- an 100-dollar bill!! And we had bought the wallet used for two bucks!!! However, I usually keep my cool and didn't start screaming #1 because I could tell my brothers and surprise them, #2 because I could tell that it might be counterfeit because it didn't have the furry feeling like most bills. First, I prayed and thanked God. Then I pretended to use the bathroom and observed the bill. It was obviously looking like one-it said federal reserve note, legal tender, and the stuff about debts being paid with it. However, it just might not be real. I decided to tell Isaac. He was so surprised! I told him not to tell anyone. Later I told John, then Miriam, then Mom. She didn't believe it until I showed her the bill. Later that day, I went to Brilliant Sky toy store and bought a remote control 4x4 car that can go on land and water, a lava lamp, and birthday and Christmas presents for all my siblings. I got to stay up a long time to play with my toys and watch the lava lamp. I didn't spend all the money, and after I paid my tithe on it I still had $14 left over, in addition to the money I had put into my savings account this week, which was 30 dollars. I'm trying to learn about being wise with my money. ... as I tinker around with my blog design this weekend. I'm hoping to give the blog a facelift, as well as make it easier to go back and find old posts. UPDATE: The design is almost done, there are just a couple of buttons missing. The major thing that remains to be done is going back through 500+ posts to get the labels on all of them the way I want them for the archives. Not sure how long that will take me to finish up. With only about four weeks left until my due date, it dawned on me this week that I really need to get serious about final preparations for the baby. Get all the baby gear out of the shed, and get it all cleaned up again (launder the covers and wash all the metal/plastic parts with soap and hot water). This being our 6th child, we have become somewhat "minimalistic: there is only a swing, a bassinette, and a Bumbo seat. Wash all the upholstery of the rocking chair and ottoman, and wipe down all the wood on them. Launder the cover for my nursing pillow, as well as my baby slings/wraps. Buy a base for the new carseat, and wash the covers. Wash a few sleepers, blankets, hats etc. for the baby to wear the first couple of days. We'll have to get more gender specific stuff once we know if it's a boy or a girl. As of right now, I have practically zero baby clothes after having given them all away, thinking I'd probably not have a third girl in a row. Make a list of two weeks' worth of breakfasts and dinners, along with the necessary ingredients to make them all, to pre-cook and freeze for after the birth. I had the idea to get together with other ladies from our church on a Saturday this month and spend the day cooking up all the food in a big "Cooking Party". I realize it won't be much of a "party", but I figure it helps to give it a deceptive fun name. Reserve a birth tub - I have been working on this for the last week. The lady I usually rent from is all booked up, because I didn't even bother to call her until I'm 8 months pregnant - duh, what was I thinking! She is trying to figure something out, and I am waiting to hear from her. Order my birth kit - I think I need to ask my midwife about this again, she was supposed to be telling me where to order it from. Find a little bouncy seat - our last one finally gave in after Becky because Miriam kept climbing into it until she broke it. Buy batteries for the swing. Stock up on stuff for the rest of the family so I won't need to go to the store for a week or so after the birth (hahahaha, I am so DREAMING with this one!). Cook all the above-mentioned meals. I am thinking about doing it the Saturday before Thanksgiving. Keep dreaming about getting a triple stroller, and hoping for a killer deal on one (the best I have found is about $150 on craigslist). Miriam will only be 3 when the baby comes, and Becky is barely 2. Even when Miriam turns 4 in February, she is so different than the boys were. She tires really easily, and also gets absentminded and either wanders off or lags behind, which is very unnerving for me. Both her and I prefer for her to ride in a stroller. Oh, I love lists. Well, not really, but I love how they help me accomplish things more easily. A sharp pencil is better than a sharp mind! The pregnancy is going well. This is a very active baby, or maybe it just feels that way because s/he is somewhat posterior right now. Not much longer! We had this for dinner tonight, and it was so delicious! I came up with the recipe as I went, trying to incorporate/use a lot of the veggies I had sitting in the fridge. ~ The type of stuff that comes in our co-op basket and doesn't get used up right away because nobody much cares for it. 1. Wash, peel and/or dice all vegetables. 2. In a large pot, sautee onion and garlic until translucent and fragrant. Add broth, and all other vegetables except for the kale. 3. Cover and simmer gently until vegetables are tender, about 30 to 45 minutes. Next, use a potato masher or stick blender to mash the ingredients a little without pureeing them. 4. While soup is simmering, cook up sausage in a frying pan, breaking it into small pieces. When soup is ready, add sausage. Remove pot from heat, and gently stir in cream. 5. Season to taste with spices. You will only need tiny bits of each, as the broth and seasonings in the sausage will already give the soup a lot of flavor. Add bouillon cube or Vegeta for additional flavor, if you like. 6. Stir torn pieces of kale into soup. Serve with hot buttered French bread on the side. Enjoy! After all the hubbub surrounding my last post on why I don't believe it is right for women to vote, and all the comments I got, I decided to cast my vote after all. I voted when, as the public fool bus was picking up less fortunate children on our street, our own children were enjoying the company of their siblings, joking with each other and furthering the close relationships between each other, over a breakfast of fresh-out-of-the-oven, made-from-scratch ham and cheese croissants, with a side of banana and orange juice. I voted when I decided not to have our children brainwashed in a humanistic school all day today, or any other day of their life, but to rather teach them godly principles at home. I voted when, instead of doing school work, I decided to suspend their studies this week so that we can more wisely spend these last few days with "only" five kids by preparing for the new baby together, enjoying the weather, and making seasonal crafts, as well as Christmas gifts from the children to the grandparents. I voted when I sat down and read the Bible with each of the children. I voted when one of the little children decided they just did not feel like taking their much needed nap today, and I decided that they were going to take one anyway, because I had said so and I'm their authority. I voted again when the same child decided to try this number again at bedtime, again with no success. I voted when, time and again, a child needed my attention, affection, assistance, or guidance, and I gave it to them, rather than being unavailable to them because I wasted my time on the phone, computer, or other meaningless distractions that can seem so much more alluring than the mundane aspects of motherhood. I voted when, instead of popping the kids in front of the TV to further be brainwashed, I sat down and read them a chapter from a wholesome book, even though I started losing my voice halfway through it. I voted when I prayed to the God of the universe, the One who holds the breath of every single human being in His hands, including that of our corrupt politicians. In fact, now that I think about it, I cast my vote hundreds of times each and every single day, in all different areas of life. No, I am not at all a perfect mother, not even by a long shot, but I can honestly say that I try to give it my best each and every single day, no matter how much I fail and come short. But did I go down to the polling booth? Nah. I was too busy voting in the areas that matter most. is the hand that rules the world. Blessings on the hand of women! Here upon our natal sod! Always to the breath of God! As a citizen of the US, I have a right to vote. However, I do not exercise this right, because I believe that based on the Bible, it is wrong for women to vote. Now, I am not trying to convince any other ladies of my beliefs. I simply wanted to share some Bible verses of why I believe what I believe, because I have been asked about it repeatedly. 1Timothy 2:12 - But I suffer not a woman to teach, nor to usurp authority over the man, but to be in silence. Based on the Bible, it is wrong for women to exercise authority over men. However, women voting can lead to a passing of laws that the majority of men would oppose. One example of this is abortion - more than 50% of men are against it, but more than 50% of women are for it, which is why it is legal. Most anyone would agree that in a democratic republic such as the US, the voting citizens are the final authority, not some monarch or ruling class (at least in theory). Hence, I do not wish to be part of the voting pool, because I do not believe it is right for women to be in charge. Isaiah 3:12 - As for my people, children are their oppressors, and women rule over them. O my people, they which lead thee cause thee to err, and destroy the way of thy paths. How true this verse is in today's world. Seems that so many parents live in fear of their children, who dictate their lives. And yes, having women rulers/politicians is mentioned as a curse in the Bible. I DO NOT support any women politicians. They are way outside the natural role that God intended for them, and as such, are not qualified. It is not because women are inferior or less intelligent. They simply fulfill a different role. Man was created by God for a certain purpose, and so was woman. If each fulfilled his God-given role, they would be happier in life, and our society would greatly benefit. I wonder if Sarah Palin would have chosen to stay at home and rear her own children rather than run for political office if it would have saved her daughter from being a single teen mom. 1Timothy 5:14 - I will therefore that the younger women marry, bear children, guide the house, give none occasion to the adversary to speak reproachfully. Squares are not better than circles, but good luck trying to fit a square peg into a round hole. I mean, maybe you could hammer it in there somehow, but it is not the way it was intended, offers no benefits, and will likely cause some sort of damage. Saying that I think women should not vote (for whatever reason) is considered near insanity these days. However, that thinking was the norm not even a century ago. The Founding Fathers quite obviously believed differently than we do today. Not that society or our forefathers were automatically right on everything, but obviously my position is not just some absurdity - it used to be as natural as air for most of human history. So now maybe we women are "liberated" and "get" to vote, but at what cost? Is our society so much better now that women act and are treated like men? Divorce, adultery, fornication, abortion, wayward children, being forced to work outside the home, etc. are at all-time highs. Some people would have us believe that before "women's liberation", women were just mistreated and abused by their selfish husbands who were more beast than man. Yet I am certain that there are many times more acts of violence committed against women and children now than back then. Did you know that statistically, the most likely cause of death for expectant ladies, and those newly postpartum, is homicide at the hands of the baby's dad? You are never more likely to be murdered by today's modern man who is so secure in his manhood that he doesn't mind sharing his authority with women than if you are pregnant or just had a baby. Why wouldn't ladies rather be honored and exalted, instead of being expected to wear pants and shovel dirt all day? How come whenever kings and other monarchical rulers want to bring glory to themselves, they want to be elevated above their fellow citizens, not be just like them? Because they know that having a certain level of honor is something special. What is wrong with a husband thinking that his beloved wife is much too honorable to be out in the work force taking orders from other men, or that his children are much too precious to simply be left in the care of hirelings? Voting is not in my area of responsibility, because as a woman, I am commanded to follow God and my husband. There should be one vote per household, and it should be the husband who casts it. Men are responsible for running the affairs outside the home, women are responsible for those inside the home. Invariably, Christians who are inflamed by a position such as mine bring up Deborah, one of the judges of Israel. As if the fact that a woman was a judge automatically means it must have been right. The Bible also tells us about people who had multiple wives, committed adultery, were murderers or thieves, etc. Please feel free to disagree with me, as long as you realize that I am likewise entitled to my opinion. And if you are a Christian, you should be able to find concrete verses in the Bible to back up your beliefs on women voting, rather than just going by emotion and what we have been programmed to believe by our godless society. Several readers commented saying that since women do have a right to vote, Christian conservative ladies should likewise vote (in some cases simply for the same candidates their husband voted for) in order to balance the scales. While I can understand their logic, I believe in absolutes. I believe it is wrong for women to vote based on principle, and my principles do not change based on the condition of our society. God is the one who ultimately controls who runs our country. Any time He wants, He could cause our entire government to collapse, and put whomever He wants in charge. We have wicked politicians because we, as a society, are wicked, and are reaping the curse of God for that. I for one do not believe that we as Christians will be able to earn favor with God and turn our country around by further disobeying his word, whatever our logical reasons might be. For every lady who decides to obey God and refuse to vote because the Bible says that women have no right to vote, even if humanly speaking that may seem counterproductive, God can bless such faith and obedience by providentially hindering one or more liberal feminists who are trying to go vote. Besides that, feminists who are aborting their children do much less to influence the next generation's voting pool than me, who will have contributed three men of voting age in about one more decade, and hope to add many more if God continues to bless us with children (who I hope will likewise do the same). I am the wife of Pastor Steven L Anderson of Faithful Word Baptist Church in Tempe, Arizona, and a stay-at-home Mom to our ten kids - Solomon (17), Isaac (15), John (14), Miriam (11), Rebecca (10), Anna (8), Stephen (6), Boaz (4), Chloe (2), and Peter (born January 2018). We spend our days learning, working, playing, and putting out all kinds of fires as we serve our Lord and Saviour Jesus Christ. I may earn a small commission for my endorsement, recommendation, testimonial, and/or link to any products or services from this blog. I only link to products or services I would use myself. Your purchase helps support my work in adding content to this blog regularly. Come check out my webstore of the cute AND modest swimsuits I orignially designed for my own daughters! Come on in to access the archives about our everyday happenings. The main hub of our house. Here, you'll find everything from recipes, to homemaking tips, to ideas for frugal living. Read about our homeschooling adventures, for which nobody in our family is too old or too young. No actual medicine in here, just lots of tips on getting and staying healthy naturally. Come on in, and don't worry about any messes. Read posts written by our oldest child, Solomon, who loves to tell everyone about his adventures. Leave a comment and make his day! The name says it all. Nobody likes to go here, but sometimes it's just plain necessary. Birth Story for Our Newest! Our newest blessing is here! Typical firstborn. Very intelligent and logical. Loves to talk. Likes for things to be "right" and organized. Very honest and fair. Exceptional musical talent. Great helper with younger siblings. Very kind and loving. Loves anything to do with being outdoors: riding bikes, hiking, camping, caring for animals, exploring, horseback riding, etc. Very reliable and polite. My "Mr. Fix-It" man. Never ever complains. Tough, but has a very tender heart. Devours books at incredible speed. Our quirky child. Funny and artistic. Precocious and empathetic. Loving older brother to his younger siblings. A bit of daredevil. Beautiful and sweet. Kind and mothering with her younger siblings. Loves being by my side 24/7. My big helper. Has a great sense of style. Full of energy. Smart and mischievous in a very loveable way. Very tidy. Loves to help with anything she can. Dotes on her younger siblings. Daddy's girl, bookworm. Sweet girly girl. Loves pretend playing with her siblings and her dollies. Wants to be a big girl like her sisters. Tenderhearted. Full of energy. Loves to climb onto anything. Wild and rambunctious. All boy, and always happy. A smaller version of his dad, with whom he shares his name and birthday. This little guy is an extra special blessing after a complicated twin pregnancy. Mellow and easy-going. Chatterbox. Smart cookie with a heart of gold. A precious little doll that brightens all of our lives. Smiles, coos, gives kisses, and brings joy every day. The newest addition to our family. A sweet little guy that brings us much joy.